In this sad and degenerate day and age America has devolved into something that is already barely recognizable – though not, as yet, as unrecognizable as our domestic enemies, the Liberals, Progressives, and their minority tenants desire and demand. 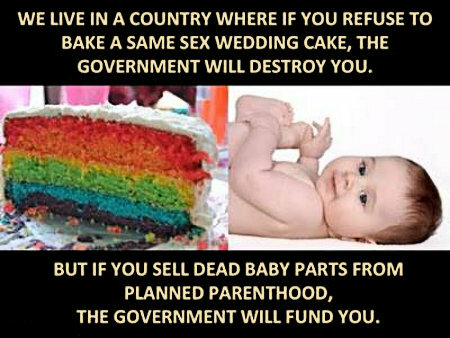 In this day and age America has politicized cake and socialized infanticide, more often called abortion and more politically correctly termed “reproductive freedom.” The government will go out of its way to persecute and destroy a business owner who won’t support the queers but will endorse and subsidize abortion mills… even when these abortionists are padding their bank accounts by selling the body parts of the babies they’ve killed. This entry was posted on Tuesday, October 6th, 2015 at 9:30 am and is filed under Politics, Society. You can leave a response, or trackback from your own site.